BlogPostsHome Sweet HomePrepare to be Charmed by Cademuir, Gordon Terrace. Prepare to be Charmed by Cademuir, Gordon Terrace. Self catering apartments in Edinburgh don’t get any better than Cademuir on Gordon Terrace. From the moment you open the gates into the beautiful kept gardens of Cademuir you will be greeted with the incredible elegance of this Edwardian maison villa. Owned by Jackie & Peter, they fell in love with it in 2002 and have called it home ever since. Cademuir was built in 1901 with two stables and a coach house. Set back from the road with landscaped gardens, it would have been a very imposing and grand villa. It had at least 12 rooms with separate family and servants quarters located in the attic rooms. In 1951 the owners at the time split the house into two homes, one for each daughter. Jackie & Peter now have the lower villa which retained the name ‘Cademuir’, which was named after the Cademuir Hills near Peebles. Jackie & Peter moved back home to Edinburgh in 2000 after 15 wonderful years in San Diego, California with their two children. They then went on the hunt to find their perfect family home. It took them two years of searching to find Cademuir, but when they did, Jackie knew immediately they had found their perfect match. 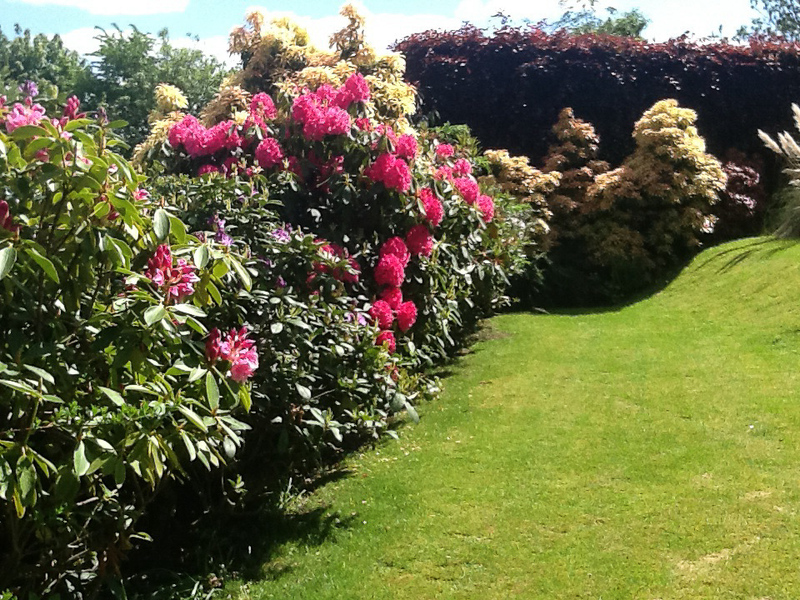 It was spring and the azaleas and rhodedendrons were in full bloom in the garden. They were amazed by the incredible architectural features throughout the house, such as the magnificent parquet flooring in the hallway to the stain glass windows and fireplaces. The house ticked all their boxes. The house was so large that there was enough space to create an annex for their family and friends to use and so the first seeds of a major project to create the annex were planted. Although the back of the house is south facing they felt the rooms were dark with small windows. Jackie says; “We wanted to maximise its southerly aspect and change the configuration of that side of the house for overall better flow and ease of use”. The main house is very traditional and this gave them the opportunity to create a contemporary space and have fun choosing all the different elements that would make it uniquely their space. Many challenges lay ahead, not least was levelling the floor by digging down a meter to allow for underfloor heating to be installed in the entire lower floor. Though time consuming and expensive, it well worth it. Jackie has created a wonderful, warm and welcoming annex with some lovely unique features. One of which is the pretty fitted dresser in the dining area. This used to be in the butler’s pantry and she refurbished it with a Carrera marble counter top to give it a sense of elegance. To set off the dining area Jackie fell in love with a Fornasetti inspired wallpaper from Cole & Son. It’s palette of golds, neutrals and blacks blends beautifully with the rest of the space. Their biggest indulgence is the summerhouse with its pizza oven and dining/seating area. This fantastic space for entertaining was designed by Peter and lovingly decorated by Jackie, with pieces they collected on their travels around the world, from Bellagio on Lake Como, Italy to Tijuana in Mexico. 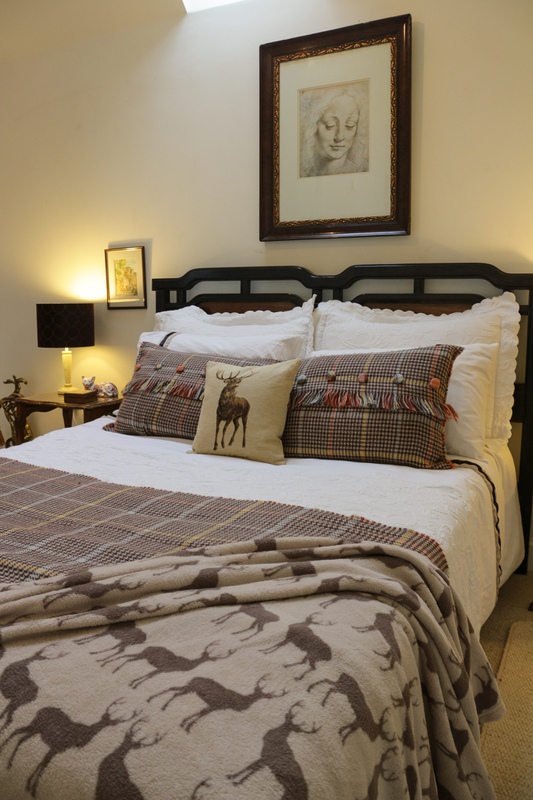 Cademuir is a truly special home from home self catering apartment, where magical memories will be created. It is available in July and August.